Saracens will be in Bermuda, and one of their own could qualify to play for the USA Islanders team to face them - Titi Lamositele (at right)..
Bermuda will host an exciting rugby exhibition game in August when top London professional club Saracens will face a team dubbed the USA Islanders. Top to bottom, a 7s game at the Bermuda National Sports Centre, where the game will be held. Kids (in the distance) play with a rugby ball on the beach at Horseshoe Bay, and Layfield along with two players from Stony Brook at the Ariel Re 7s. 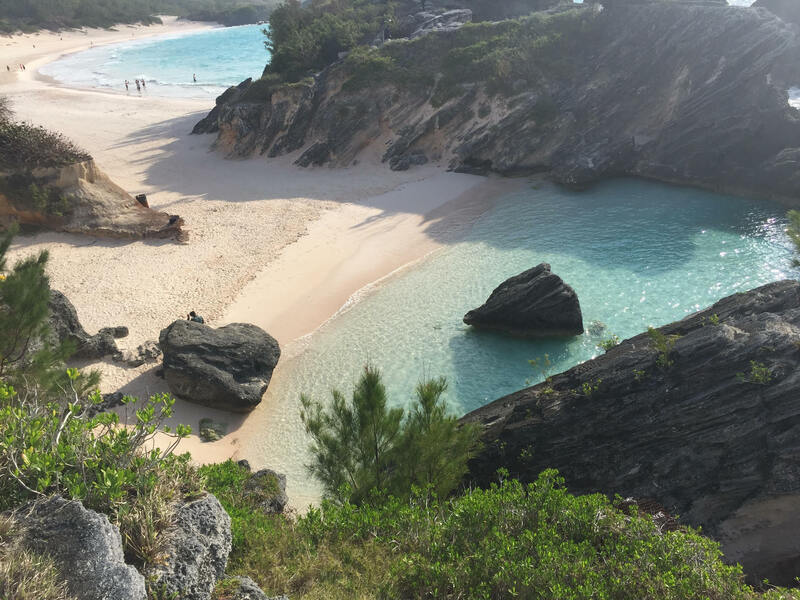 Saracens will be in Bermuda for their preseason training. The Aviva Premiership team has a strong connection with the USA, what with several Eagles having played for the club or playing now (including current USA prop Titi Lamositele), and having a partnership with the Seattle Saracens club. The pro club will hold its preseason in Bermuda for the 5th year in a row, and the exhibition game Saracens plays there is the Atlantic Rugby Cup. International businessman and Bermuda RFU Chairman Gareth Nokes was instrumental in getting Saracens to use Bermuda, and thus helping support charitable efforts for local youth. "The primary focus is to raise funds for our charity however, in doing so, we get to watch world class rugby being played on our little island. What's not to love?" said Nokes. Also heavily involved is promoter John Layfield and URugby's Stephen Siano, and they have worked out a deal to take a team of US-based Pacific Islander players to face off with the pro club. 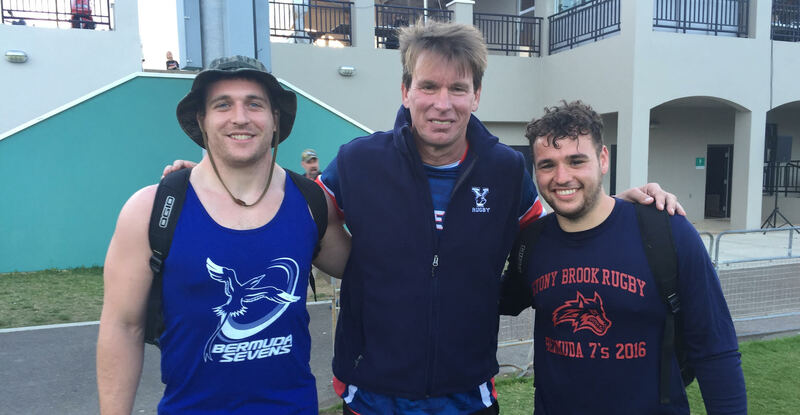 Layfield is a retired professional wrestler and WWE commentator who has identified rugby as a way to reach youth in Bermuda. He has strong ties to Bermuda and has worked with Siano putting on the Ariel Re 7s on the island nation. He secured backing for the USA Islanders team to travel to Bermuda for the game. Former USA star Vaha Esikia has agreed to coach the USA Islanders team, with a coaching group of other prominent Pacific Islander coaches to be confirmed. USA players are also reportedly going to be made available for this game. The Islanders would basically be players of Tongan, Samoan, Fijian, or Hawaiian descent, although those connected with the event say the term "Islanders" is somewhat fluid, and if there's a good player from Puerto Rico, then that could work, too. "What we want to do is set this is part of the pathway," said Esikia. "We can help good islander players be seen. We know there's a lot of talent out there, and this team will give them an opportunity." Esikia said he wants to hold tryouts in different areas around the country, and while there are some prominent players who could well be on this team, it's likely a few will be unearthed. "There'll be guys from DI, DII, and DIII clubs, and also colleges, we're looking everywhere," said Esikia, adding that the players he will be looking for must be USA-eligible. The game itself is slated for August 10 and will raise money for Beyond Rugby, an initiative, for which Layfield is the spokesperson, to help the youth of Bermuda. More information will come, but players interested in being considered can email Vaha Esikia at vaha@lasvegasrugbyacademy.com ... or fill out this form. Who could be on the USA Islanders team? While Esikia has laid out plans to find new talent, some existing players are obvious picks. USA 7s players Andrew Durutalo, Folau Niua, Martin Iosefo, Maka Unufe, and Tai Leuta are all logical candidates. Recent 15s caps or USA Selects players, such as Mike Te'o, Shalom Suniula, Siaosi Mahoni, Langilangi Haupeakui, and Lemoto Filikitonga would also fit the team. And there are some young players - David Ainuu, Nafi Maafu, Vili Helu - as well as some veterans - the ageless Mose Timoteo, Tai Tuisamoa, and Ata Malifa - who would make sense, too.